An Essex Yacht Club Wedding gives couples a venue with breath-taking water views and a nautical celebration. The Essex Yacht Club is located a few miles up the Connecticut River from Long Island Sound. The club was founded in 1933, with the principles of friendship and a deep love of yachting at the core of its creation. Members of the club find that it is a place of friendship, family, and most notably a love of sailing. Those who belong to the club have been known to enjoy taking their boats along the coast from New York all the way up to Maine. 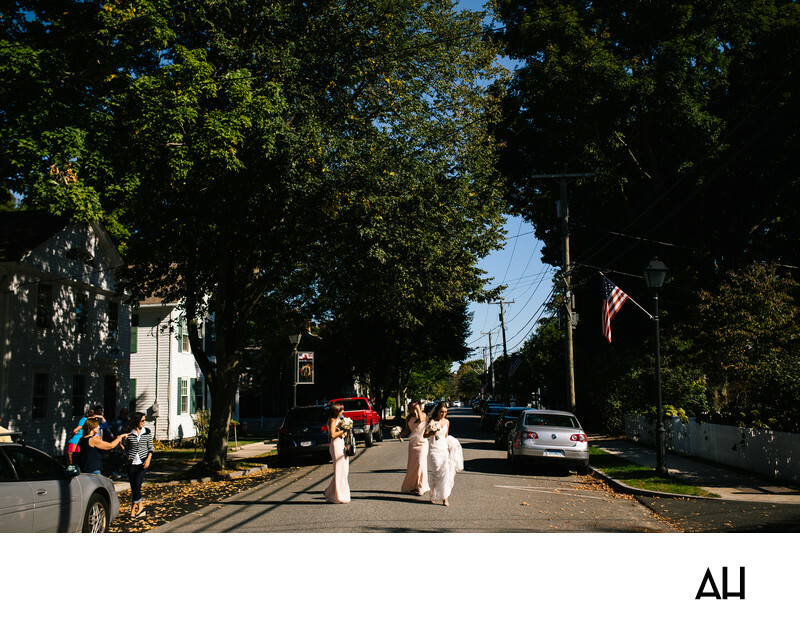 This Essex Yacht Club Wedding picture shows the bride and two of her maids walking down the streets of Essex to the wedding ceremony. Neighbors point to the girls and wave them off as the bride begins her day of celebration. The street is quaint, lined with trees that give shade to the sidewalks. Crossing the street brings the girls out into the sunlight, and gives the bride extra glow. The two bridesmaids have stopped to check with one another on whether they have remembered everything they needed for the day, but the bride walks onward towards her future.